Tokyo (Japan) – August 15, 2018 (travelindex) – Best Western Hotels and Resorts has unveiled plans to launch a brand new hotel in the heart of Tokyo’s Akihabara district, the home of Japan’s famous Otaku culture and electronics shops. Scheduled to open its doors in October 2018, Best Western Hotel Fino Tokyo Akihabara is a stylish, state-of-the-art midscale hotel that puts guests in the center of the action. 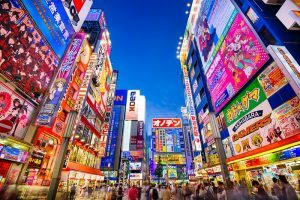 Located in the Chiyoda ward of downtown Tokyo, Akihabara is the spiritual home of Japanese youth culture, with colorful consumer electronics stores lining the lively streets, alongside shops and cafés specializing in manga and anime. The new hotel will feature 80 contemporary rooms, all equipped with comfortable beds and cutting-edge facilities. Every morning, guests can start their day with buffet breakfast featuring a selection of Japanese and international dishes plus high quality coffee. Then throughout the day, a hotel vending machine will offer quick snacks and drinks. The central location and modern facilities of Best Western Hotel Fino Tokyo Akihabara will make it the perfect option for business and leisure travelers seeking a convenient, well-connected and affordable place to stay. “Buzzing with life day and night, Akihabara is one of Asia’s most exciting and iconic urban areas. Best Western Hotel Fino Tokyo Akihabara is an exceptional new hotel that will provide guests with international accommodation and services in the heart of this dynamic district,” commented Olivier Berrivin, Best Western Hotels & Resorts’ Managing Director of International Operations – Asia. “This launch marks our latest partnership with Fino Hotels Co., Ltd. in Japan. I am confident that this superb midscale hotel will become extremely popular with all guests, whether they are seeking to soak up the pop culture of Akihabara Electric Town or simply need a convenient base for their next Tokyo business trip,” Olivier added. Located less than 400 meters from Suehirocho Station and Naka-Okachimachi Station on the Tokyo Metro, and just 17km from Tokyo’s Haneda International Airport, Best Western Hotel Fino Tokyo Akihabara is highly accessible for local and overseas travelers. The new property will become the fifth Best Western hotel in the Tokyo Metropolitan Area, following Best Western Tokyo Nishikasai, Best Western Tokyo Nishikasai Grande, Best Western Rembrandt Hotel Tokyo Machida and Best Western Yokohama. It also joins a growing portfolio of 17 Best Western hotels and resorts located all across Japan.